They should have vanished a century ago after Russia's October Revolution, melted down with the rest of a solid silver tableware set by Faberge, Imperial Russia's legendary jeweller. And yet, two knives from the collection have just resurfaced in Poland. After the 1917 revolution deposed Tsar Nicolas II, the Bolshevik-ruled Russia that emerged needed money to wage war and consolidate its power. To this end, the valuable possessions of pre-revolutionary elites, including the tsar, aristocratic and bourgeois families as well as the Russian Orthodox Church, were nationalised. Handcrafted gold and silverware, platters and goblets were melted down to obtain precious metals. More than 100 pieces of silverware, including plates, dishes and cutlery, made by Peter Carl Faberge for Saint Petersburg's wealthy and noble Kelch family, met the same fate. But, as it turns out, not all was lost. 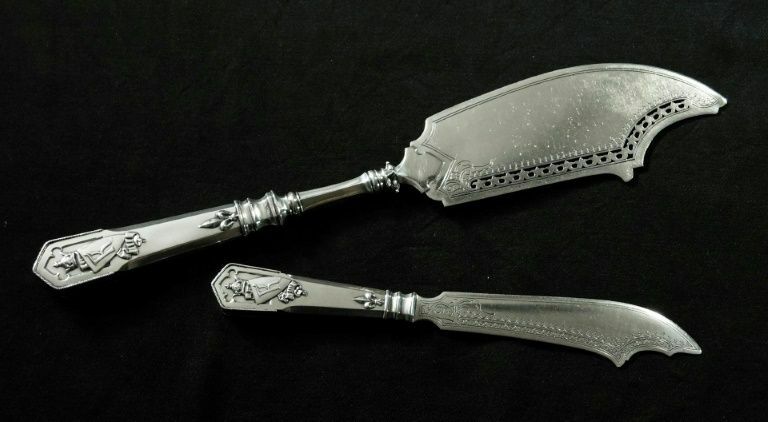 "Two fish knives -- one for serving that is 35 centimetres (14 inches) long and another for individual use that is 21 centimetres -- were miraculously spared," Adam Szymanski, a Polish art historian and Faberge expert, told AFP. Up to now "art historians and the Faberge Foundation thought that this silverware service had disappeared forever, in its entirety," he said. But, as Szymanski reveals, the two knives were spared thanks to a Red Army soldier, who was given them in 1918 as a form of payment for helping in the melting down of the rest of the neo-gothic style tableware set. In 1921, he sold them to a Polish doctor and the details of their whereabouts remain vague through the post-war years apart from the fact they were in the possession of one family. The knives were sold to a new owner in 2016. Their neo-gothic design, which Faberge used very rarely, makes the knives even more unique, he adds. The story of the knives dates back to 1900. Barbara Kelch-Bazanova, who, before she married, had inherited one of the greatest Russian fortunes of the time, commissioned the silverware for the significant sum of 125,000 rubles from Faberge, a Russian jeweller of German-Danish origin. He had inherited his father's business in 1870 and became famous for the jewel-encrusted golden eggs he created for the tsar. Alexander III commissioned his first egg from Peter Carl Faberge as an Easter present for his wife, Tsarina Maria Feodorovna. She was so taken by it that Faberge was named jeweller to Russia's imperial court. He created 52 eggs for the Romanov tsars and seven for the Kelch family, all intricately decorated in gold and precious and semi-precious stones and in different styles such as rococo, Empire and Louis XVI. Living in Saint Petersburg, Barbara Kelch-Bazanova was fabulously wealthy but was the daughter of Muscovite merchants. While her husband was of noble stock, she was a social climber and determined to further ascend the ranks of the rarefied Russian aristocracy. The tableware for 32 people that she commissioned from Faberge was meant to dazzle guests invited to dinner in the neo-gothic dining hall of the Kelch Mansion, which later survived the revolution intact. "There's no doubt, the letter 'K' on the knives is exactly the same as the ones we find engraved in the Kelch dining hall," Szymanski says. "The knives have the Faberge stamp... the name 'Faberge' in Cyrillic print is very legible," he adds. A photograph of the tableware set taken in 1902 for an exhibition of Faberge's work by Tsarina Maria Feodorovna presents visual evidence of the knives' authenticity. Barbara Kelch moved to Moscow after getting divorced in 1905 and according to Szymanski, the tableware set likely followed. It was there that, after the revolution, the silverware was confiscated and destroyed. Szymanski said that the Russian soldier, who acquired the two surviving knives, soon sold them and other valuables to one Jozef Wolski, a Pole. Their current owner, a Polish collector who learnt that the pieces were part of a Faberge set when he sought Szymanski's expertise, keeps them in a bank safe. According to Szymanski, a US collector has already offered a million euros ($1.2 million) for the two knives, and an anonymous Russian collector has also expressed an interest. While two jewellery experts, contacted by AFP, expressed no doubt about the knives' authenticity, they had a more nuanced opinion about their value. "Cutlery is mass-produced and its value is never that extraordinary," said Alexander von Solodkoff, a German expert and member of the Advisory Board of the Faberge Museum in Saint Petersburg. "It's the large central pieces of the set that were most valuable," he added. "If I were the owner, I'd accept a million dollars straight away!" commented French specialist Maxime Charron, with a hefty dose of irony. "Despite being quite rare and interesting, it's just simple cutlery," he told AFP. They should have vanished a century ago after Russia's October Revolution, melted down with the rest of a solid silver tableware set by Faberge, Imperial Russia's legendary jeweller. And yet, two knives from the collection have just resurfaced in Poland.